I'll have the leather wingtips, but can I get that with sauce on the side? Thanks. 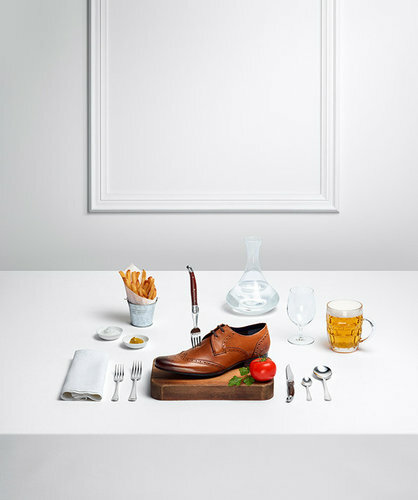 British clothing company, Ted Baker, linked up with photographer Sam Hoffman, food stylist Iain Graham, and set designer Linnea Apelqvistto to create Tastefully Ted—one of the classier and more meticulously crafted food-themed fashion campaigns we’ve seen (and you know how we feel about food and fashion). 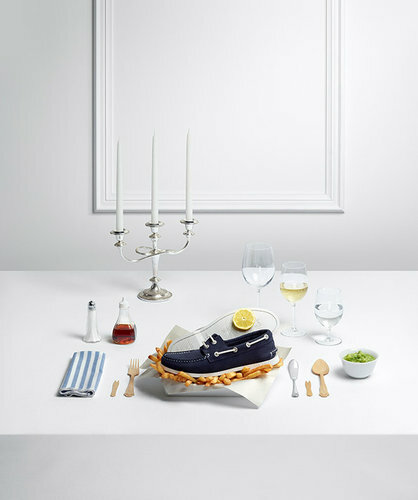 In the shoots, Ted Baker shoes are served on tables alongside wines and different cuisine options: boat shoes plated on a stack of fries, high tops lightly dipped in tomato soup, and heels accompanied by vanilla ice cream and chocolate sauce, amongst others. While most food-fashion mashups come off as tacky, and at times repulsive, Ted Baker has actually produced something pretty eye-catching. Bravo. Click through the gallery above to see the appetizing Ted Baker collections and watch the campaign video below.